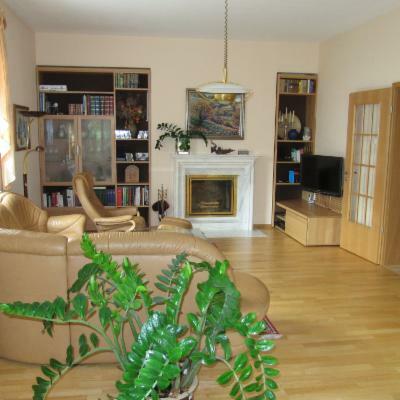 We offer a detached house in the south outskirt of Leipzig with a convenient access to highway and city-center. The house is constructed in two levels. Our living room connected with an open kitchen, four bedrooms, big bathroom, additional guest bathroom with a shower offer sufficient place for 5 to 7 persons. A friendly south-terrace and a garden are inviting to relaxing barbeques. The city-center offering numerous places of interest, museums, theaters, restaurants is easy reachable by the public transport as well. Due to easy access to the highway and relative short distances following interesting goals are available: The world known city of Dresden is 120 km away. The porcelain-city Meissen (Dresden china) is 100 km off on the way to Dresden. Berlin is 197 km away. Neighboring Czech Republic (city Karlovy Vary, Czech Republic 170 km) and the city of Prague (260 km) could be visited as well.